The Dutch printmaker Maurits Cornelis (M.C.) 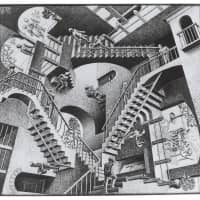 Escher (1898-1972) followed in historical foundational art footsteps. His preoccupation with perspective was like that of the Renaissance; his self-portraits in convex mirrors remind us of Jan van Eyck (c. 1390-1441); the intricate stone topographies of his early oeuvre were in the vein of Andrea Mantegna (1431-1506) and his mesmerizing architectures recall Giovanni Battista Piranesi (1720-78). 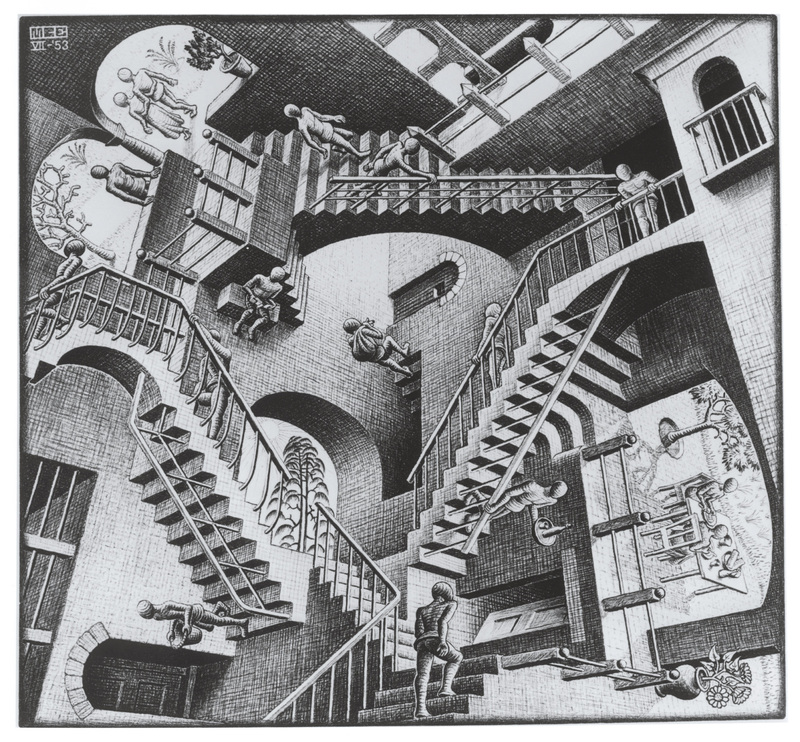 Escher’s audiences, however, were mostly from outside the art world. “The Miracle of M.C. Escher: Prints from The Israel Museum, Jerusalem” at the Abeno Harukas Art Museum commemorates the 120th anniversary of the artist’s birth with 152 works. A familial connection to Japan is that Escher’s father, a hydraulic engineer, had worked in Osaka as well as in Mikuni and other areas of Fukui Prefecture between 1873 and 1878. Escher’s father wanted his son to be an architect, but Maurits was more interested in woodcut printing. Work from his younger years featured naturalistic representations of western Italian sceneries and townscapes, like “Castrovalva, Abruzzi” (1930), allegorical depictions of the world influenced by art nouveau and religious subjects. These themes, though, largely came to an end in 1935 after he copied Hieronymus Bosch’s depiction of hell from the “Garden of Earthly Delights” (c. 1490-1500), partly in protest against the rise of fascism in Italy where he had been living. Escher subsequently continued to pursue an optical bent that he had started in the 1930s, illustrating reflections such as those in “Still Life with Mirror” (1934). Many of these followed, depicted in the Christian vanitas tradition, a popular genre of 16th- and 17th-century Dutch and Flemish painting. Next came a thematic evolution into geometry and jigsaw-puzzle-type configurations, influenced by his admiration for the mosaic patterns by Moorish artisans in Spain’s Alhambra palace. Crystallography, too, was a conceptual guide, introduced to him by his older brother Berend, a geology professor. 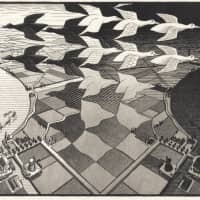 Escher became artistically fascinated with tessellation, how two-dimensional surfaces could be tiled with specific geometric shapes without them overlapping or leaving gaps, resulting in, most famously, the morphing white and black birds of “Day and Night” (1938). His interest in the infinite extension of such patterns and the possibility of gradually transforming their shapes to have them morph into different ones, also brought about “Metamorphosis I” (1937) and “Metamorphosis II” (1939-40). Ultimately, he came to create his own universes, such as “Double Planetoid” (1949), and went on to visually play with the Droste effect, making surface structures concave or convex, as is visible in “Print Gallery” (1956). 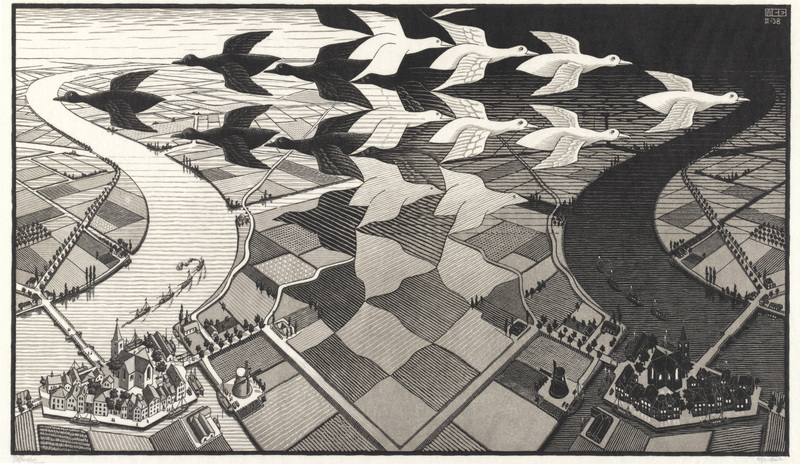 Escher’s prints appealed to divergent specialists rather than art critics. The English physicist and mathematician Roger Penrose sent Escher mathematical descriptions to which he gave concrete form; brain research labs used Escher’s optical illustrations as research tools for a while; architects, mathematicians and perception psychologists were inspired by his designs; and his works eventually became the recognizable imagery of geometry and biology textbooks. During the ’60s, hippies, rock musicians and anti-establishment types were also captivated by Escher’s woodblock prints, though he refused Mick Jagger permission to use an image for a Rolling Stones album cover. His work’s appeal to the popular imagination has since endured, a prime example being the regular appropriation of “Ascending and Descending” (1960), the print famous for its staircase that only ever goes up, even though it incongruously returns to its initial step, ad infinitum. “The Miracle of M.C. Escher: Prints from The Israel Museum, Jerusalem” at the Abeno Harukas Art Museum runs until Jan. 14; ¥1,500. For more information, visit www.aham.jp.